R11000 is rated 4.8 out of 5 by 45. Rated 5 out of 5 by Babs from Anther great Delta product Highly recommend. Easy to follow directions and easy installation. Will only buy Delta, they stand by their products. GREAT tech support. Rated 5 out of 5 by LMTM from Works as designed Works as designed. Delta backs all their products. An easy decision for homeowner. Rated 5 out of 5 by Lucky from Great product. Our contractor installed it and it works great! Delta makes high quality products. Rated 5 out of 5 by three_jeeps from Works very well Used in shower remodel in 2010. Replaced all plumbing fixtures with Delta, including this diverter. Installation instructions are straight forward, easy to install. Configured as 3-way. Six plus years of 2-3 times/day use and still working well. Only 'complaint' is that (at that time) the escutcheon styles did not match very well with the delta water valve we chose. What types and how many rough in valves will I need? I am installing two fixed shower heads, a handheld, a rain shower, and 2 sets of body sprays (3 each with different on/off controls) in my master bath. I was told that one R10000 UNBX valve and one R11000 3/6 diverter would be sufficient. However, my plumber advised that would not work and its better to have more diverters because when I want to run multiple items at once, the pressure will be extremely low where I will be getting only drops of water. I want to be able to run a max of 3 items at one time without any water flow/pressure loss. What types and how many rough in valves will I need? can you get this valve w/stops? how to make water flow though port 3 left side instead of port 2 in right side? 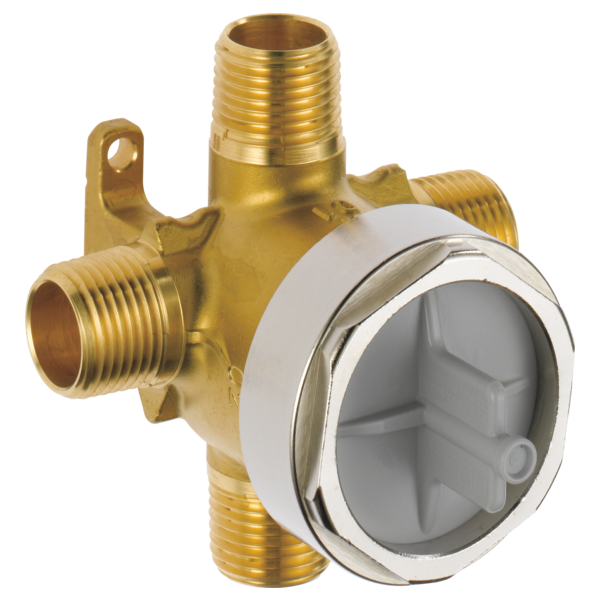 I want to install (4) body jets and need to ensure the flow rate from the diverter is as high as possible. I will use a 6 setting cartridge/trim. What is the GPM of this unit at 60 and 80 PSI of water pressure: 1) when water is dedicated to one port; and 2) when water is shared between two ports? The mounting instructions are very unclear, how deep from the finished tile surface does the diverter need to be set? 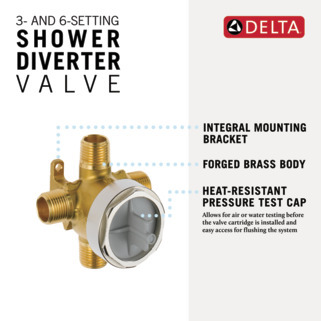 I am purchasing your R11000 Diverter Valve and need to know where I would find matching trim kits for this? Need part#s or a location on your web site to find possible solutions.